A pizza delivery driver said he was shot and robbed after delivering an order to a home in west suburban Batavia. 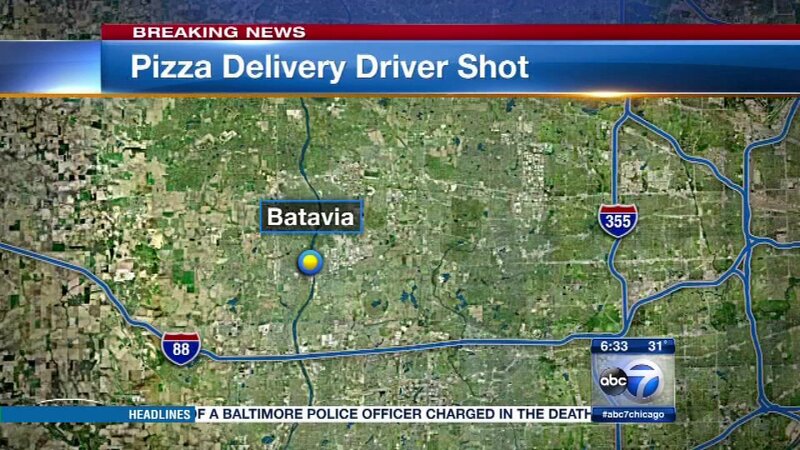 BATAVIA, Ill. (WLS) -- A pizza delivery driver said he was shot with a pellet gun after delivering an order to a home in west suburban Batavia. Police said the 51-year-old man was making a delivery to a home in the 300-block of Woodland Hills Road around 10:20 p.m. when her was grabbed from behind. During a struggle, police said he was shot in the head with what appears to be an compressed-air pellet gun. His injury was not life-threatening. He also had scrapes and bruises. The suspect drove away in a dark-colored SUV, possibly an older model Jeep Cherokee.